Join the Hike for Health: an adventure of a lifetime! Trek the Great Wall of China and raise funds for Bowel Cancer New Zealand. 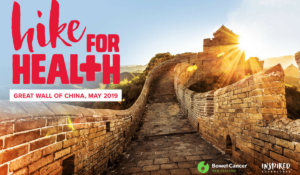 The Hike for Health brings together supporters from various New Zealand and Australian health and medical research organisations for an adventure trek to the Great Wall of China. You’ll be part of an incredible team, raising awareness and funds for a health organisation close to your heart. You’ll stand united, as a team, atop the Great Wall, knowing the difference you’ve made. New Zealand has one of the highest rates of bowel cancer in the world and bowel cancer is the second highest cause of cancer death in New Zealand. More than 3,000 people are diagnosed with bowel cancer each year and more than 1,200 will die from the disease. With early detection bowel cancer is curable in more than 75% of cases. The fundraising from this adventure will enable Bowel Cancer New Zealand to continue providing vital education and awareness for early detection of the disease as well as offering support to those who are already affected by bowel cancer. Want to learn more? Enter your details from the website to instantly receive your information pack. Questions? Give us a call on 09 280 3339.